After writing my review of the two Wacom Bamboo Stylus feel replacement pens for the Surface Pro, I honestly thought the debate was settled: those two options are clearly better than the standard pen that ships with the Microsoft tablet and it's really a personal/monetary call as to which you decide to buy. As I remind every reader constantly, I'm no artist, so I really wanted to understand what a professional found wrong with the pens. There was no sense trying to change his mind about the Surface Pro because I agree with most of his complaints; I just believe that warts and all, the Surface Pro is still the best "poor man's Cintiq" on the market. @hijinksensue's complaints about the Wacom pens rang true to me: "can’t find the button without looking at it, no eraser and the textured tip has too much resistance." He suggested I look at the following pen options, two nearly identical options built by Wacom and Samsung respectively for the prior generation of Series 7 Slate pc's. 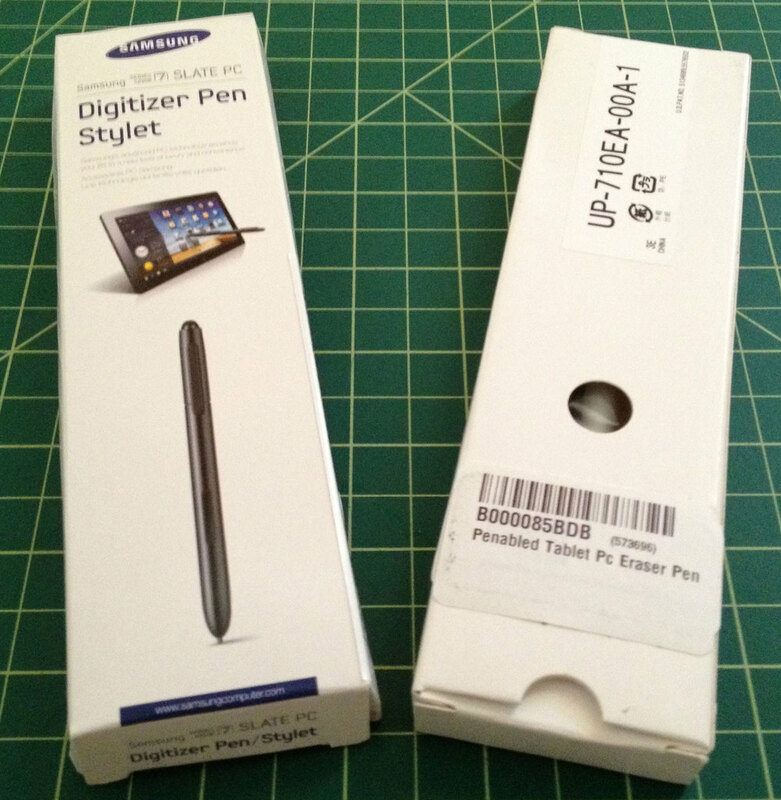 The generically named Digitizer Pen Stylet and Penabled Tablet PC Eraser Pen ship in suitably generic packaging. The generically named Penabled Tablet Pc Eraser Pen (Model UP710E) by Wacom sells for $27 on Amazon.com. 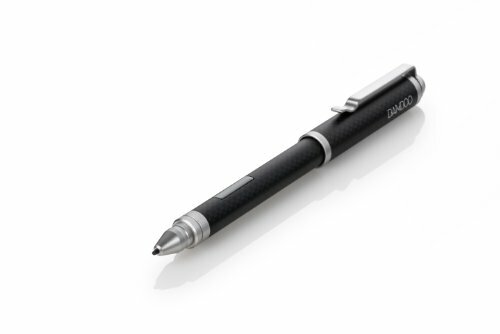 It features a pressure-sensitive tip, a single-side switch and a pressure-sensitive eraser. The pen is 5.5 x 1.5 x 0.5 inches and weighs 1 ounce according to the product specification page. 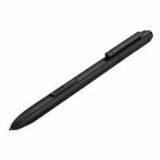 The nearly identical Samsung Electronics Slate PC Digitizer Pen (AA-DP0NE2B/US) sells for $34.58. The product specs page says that this stylus is 7.4 x 2 x 0.7 inches and weighs 0.5 ounces. One or both of these descriptions is clearly wrong, as the pens are the exact same length. It's possible that one weighs more than the other, but the difference is too small for me to notice. From tip to eraser, I measure the pens at 5.5 inches long. The barrel of the Wacom version is slightly wider, which I prefer. The Samsung pen has a clip which the Wacom lacks. Both are significantly smaller and lighter than the Bamboo Feel Carbon and Black. 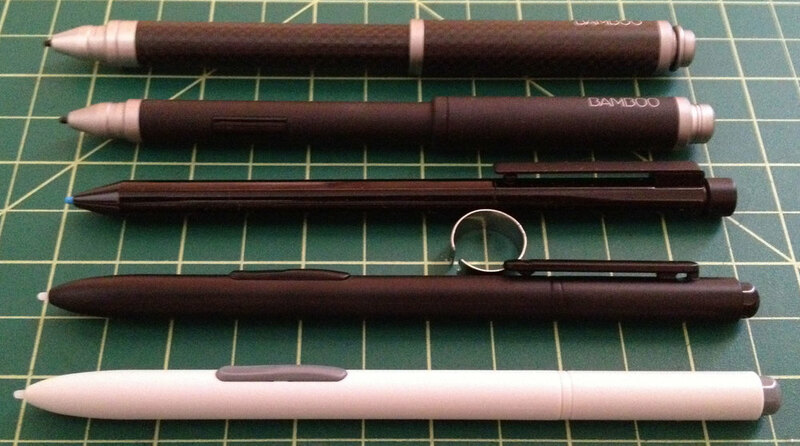 Judging by weight and finish alone, I'd pick the Bamboo Stylus Feel Black because I prefer its matte finish. Although they're both plastic, I do prefer the finish of the Wacom and Samsung pens over the standard Surface Pro stylus, whose slick finish and thin diameter just doesn't feel right in the hand. The buttons on the Wacom and Samsung pens are also slightly curved so they slightly cradle the index finger vs. the flat Surface Pro button. I absolutely agree with Joel that that the raised button and eraser tips on both pens are a huge improvement over the Bamboos. I'm either always accidentally pushing the flush Bamboo button or searching for it to activate a feature. I've mapped Undo to the button, but that's mostly because the Bamboo Feels omit the eraser tip. Why do manufacturers make such odd design choices, especially on an $80 pen? Are they conscious decisions meant to protect existing higher end products? The Samsung Digitizer Pen/Stylet (left) and the Wacom Penabled Tablet PC Eraser Pen each ship with five nibs and an extractor ring. Both pens ship with five plastic nibs. Here's where I have to disagree with Joel: I can't appreciate any difference drawing with them vs. the Bamboos with their plastic nibs installed. I actually preferred the textured nibs that the Bamboos also include by default. The tactile feedback is just enough to convince me that I'm not gliding on glass. But it's nice to have the option, which the two less expensive stylii don't offer. In my quick tests in Manga Studio, I found that Samsung pen's pressure response seemed a little higher than the Wacom stylus. But once again, I can't offer a precise measurement beyond my "feel." That's the odd thing about pressure sensitivity. You can't really appreciate it except when it's missing. So will I switch? I respect you Joel, but no I won't: I simply prefer the weight, balance and finish of the Bamboos. But if I have a project where I need to have the button and eraser at the ready, I'll have no problem making the switch then. Between the Samsung and the Wacom, I'll have to go with the Wacom, due to its slightly lower price, larger girth and the lack of a clip, which I find distracting in my hand. So what do you think? What's your personal preference? Am I right or wildly off the mark? Do you know of any other pens I should test? I look forward to reading your comments below. Never mind the lens distortion: the Bamboo Stylii are signifcantly larger than the standard, Samsung or Wacom options. Clicking on these links directly supports this blog.